Last year we finally got to visit the fairy tale mountain village of Hallstatt, tucked away in the breathtaking Alps of Austria. 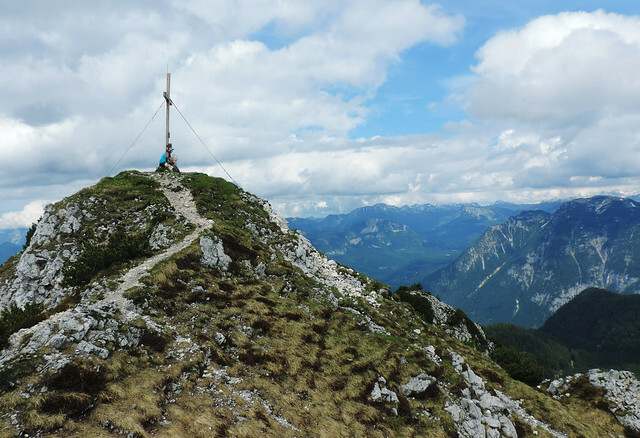 Whenever we visit the Alps we always grab the opportunity to do some hiking and it’s the best thing one can do there in our opinion (other than skiing or exploring pretty mountain villages like Hallstatt…). 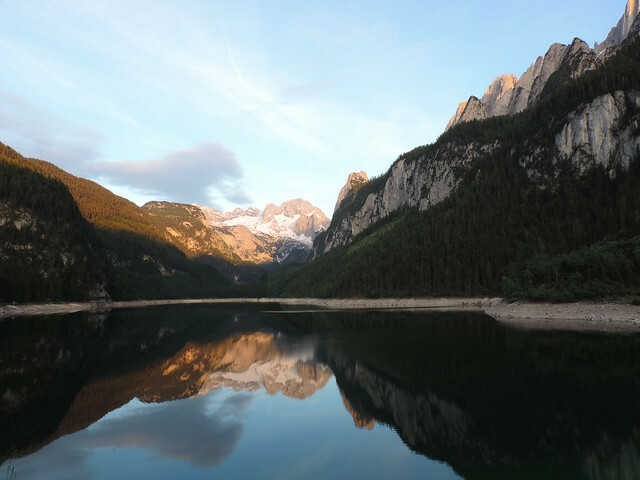 What is Salzkammergut famous for? Salzkammergut is the region where Hallstatt is located and most of it is listed as a UNESCO World Heritage Site – including the towns of Hallstatt, Obertraun, Gosau and Bad Goisern. The region got its name after Hallstatt’s famous ancient salt mine. 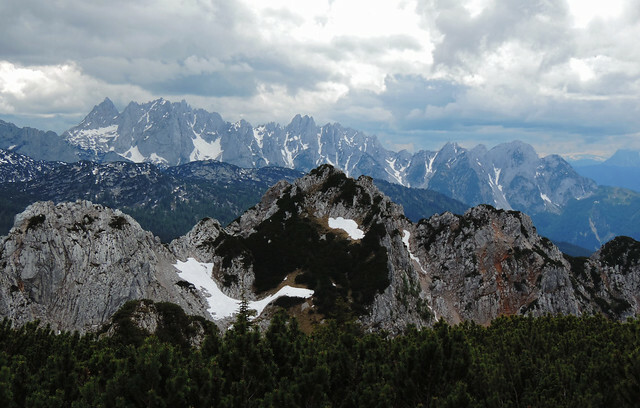 But it’s rich in natural beauties, as well, the most spectacular ones are probably the glaciers on the Dachstein. May was a magical time in Gosau Valley, anyway. Millions of colorful wildflowers were in bloom while the surrounding peaks were still covered with snow. 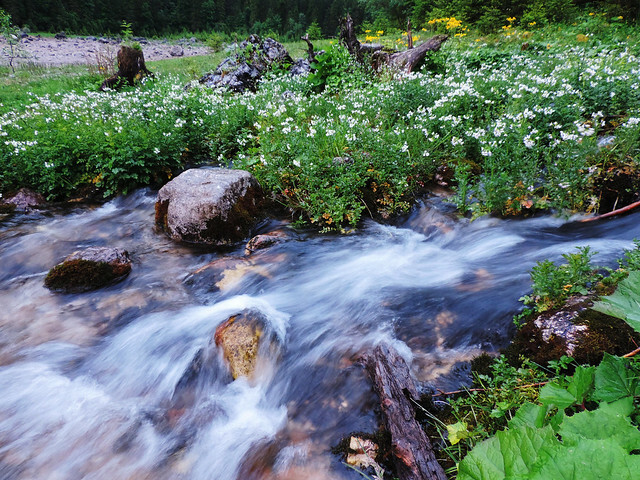 But what could be even more tempting than Alpine meadows in bloom? Alpine lakes, of course. 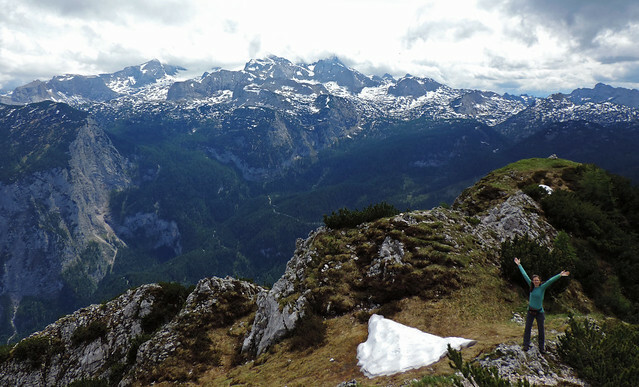 The first hike we planned was the Trail of Gosau Lakes (Gosauseen in German). This is a full day hike from Lower Gosau Lake (Vorderer Gosausee) to Upper Gosau Lake (Hinterer Gosausee) and back. But on that particular day we woke up to pouring rain that lasted mostly all day long… So we ended up visiting some caves in the area and then got back to our cosy room. 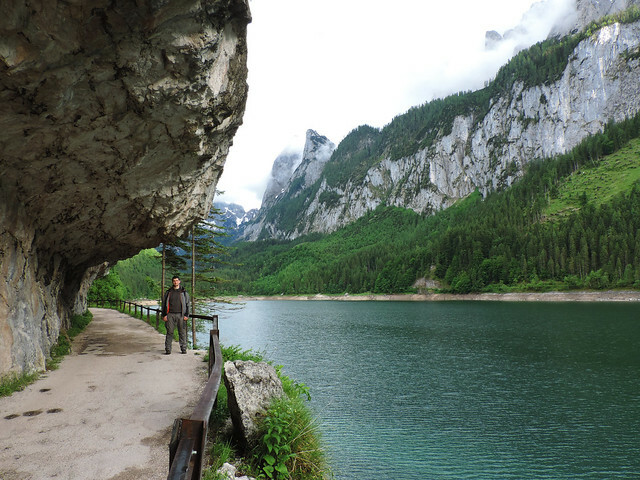 We didn’t have time to do the hike to Upper Gosau Lake, we chose the easy loop trail around Lower Gosau Lake instead. 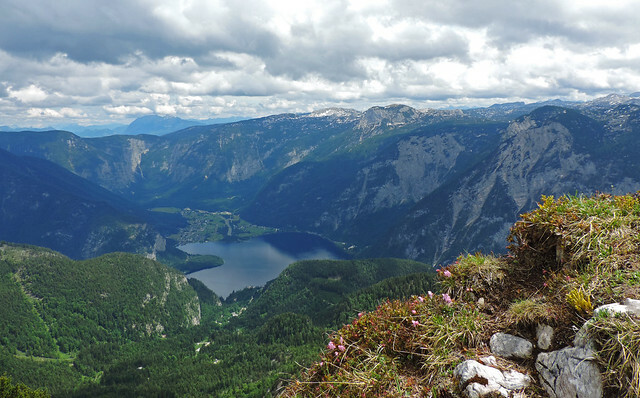 The lakes are fed by the Dachstein glacier and the melting snow from other mountains around. The easy trail around the lake offers spectacular views of the surrounding peaks reflecting in the crystal clear water. 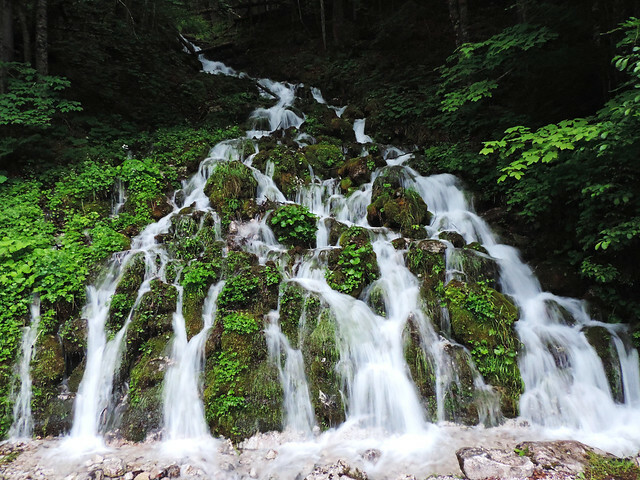 Some charming little waterfalls are also hidden in the forest. 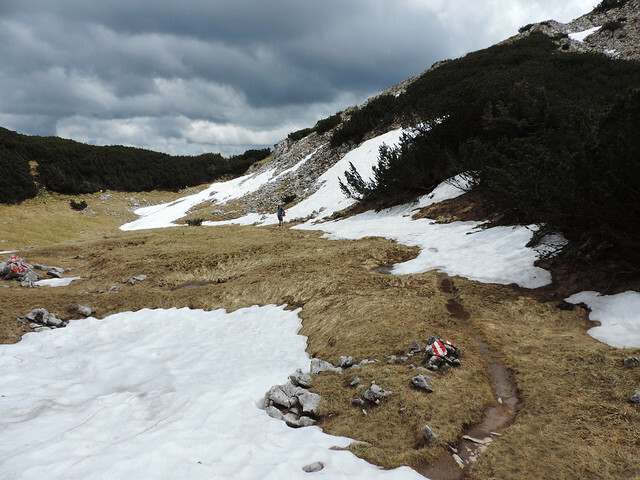 We did a short detour to Gosauseelacke – a pond between the two Gosau lakes -, but since it’s still far from the Upper Lake, we returned to the loop trail and got back to the parking lot when it was already dark. Bright blue sky greeted us the day after and we started our hike early. The destination was 1953 meters high Plassen peak. 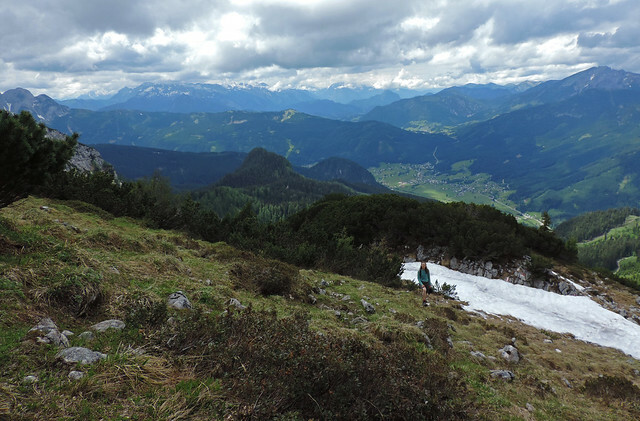 We started the long and strenuous climb in Gosau Valley and the blooming meadows were tempting for a picnic. But we rather followed the trail that lead us into the forest. It was lush green and just as beautiful in the morning sunshine. Have you been to the Austrian Alps?